Don't miss out on the savings . 10% off our popular VTEC B Series Kit and B-Series Upgrade! Plus, 5% off all other VTEC upgrades! Sale Ends Jan 12, 2019 so don't delay! Supercharged VTEC All-Wheel-Drive 2.0L Mini Clubman Estate! MINI Countryman? Please. Here's a REAL AWD Mini. Oh yeah, and it's SUPERCHARGED with a VTEC too. This is the story about HS-Racing in Sweden. It started with a dream, a dream to be fast and furious, but most of all - HAVING FUN ! 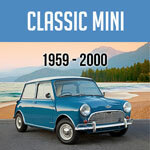 In 2007 a standard mini with a 1000cc engine was purchased, and the fun begun. It had been a “lady cup” car from the beginning, so it was almost ready to race, Well not really... After a long winter and a total makeover it started to look like a race car again. At this point the 1000cc engine had 73 wild and furious horses under the bonnet. The team was very excited and went to the first race in 2008, it ended in with a total disaster with a cloud of smoke throughout the whole pit lane; broken head gasket, and a cracked engine block - a less excited team went home. 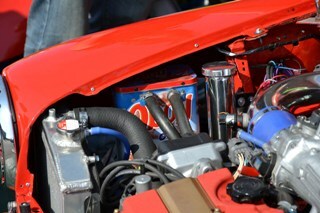 Quickly we ordered a new race spec 1380 engine to fit in the mini. In Race number two we ended up in 2nd place and was got received the Rookie of the year award. During the following race events we ended up in the top 5, still fighting in the standard1000cc class. 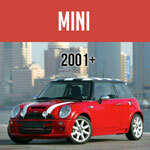 In the spring of 2009 we wanted to go faster so we purchased the “sport class” mini we are driving today. It was equipped with a 1380cc and dog box with quaife diff and Yokohama A048, so the traction was way better than the standard mini. 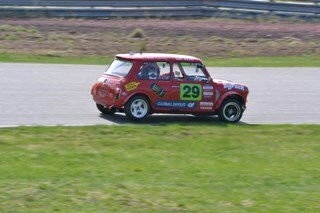 It also had Öhlins shocks, the best of the best! In 2009 we ended up 2nd overall in the sport class. For 2010 we had to set a higher goal and to win the series and with better pit-strategy we ended up in 1st place. After one week holiday we started to tare the mini apart and did a total makeover…. At this point we had won the whole series, but with a very big budget, so we decided to change the setup of the car to get more “bang for the buck”..
We found the superfastmini..com website and after many.. really many eMails to Mr BJ and Norm at the superfastmini (thanks for the good support) we purchased a Ultimate MTB2 package with a B16a JDM engine. At this point the body was ready for a Honda engine, the package arrived and the big build began. The installation of the engine was really straightforward, except for the electrical, we had some trouble finding the right wire colors in the harness, but after a couple of days we got it sorted! Meanwhile as the build was going along we didn’t tell anyone in the race series what we were doing, we wanted to surprise everyone with our Vtecmini.. soon we discovered another team doing the same thing.. but they were building on another subframe. 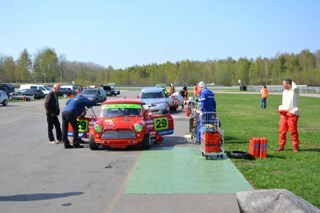 In (month) 2011 we finished up the car two days before the first race, so we didn’t have time for testing shakedown nor any test days... we had 1hour of total testing and adjusting the Mini at the racetrack before the start. We now discovered that the shocks and dampers were was good for the street but not for the racetrack. Driving with one wheel in the air in the corners is not good race handling. We had a minor problem 8 minutes before finish, so it ended up with disappointment for the team but also a kick in the but to get it up and running again for to the next race. Willwood pedals and front brake, Mazda miata rearbrakes, Brake bias adjust from driver seat. 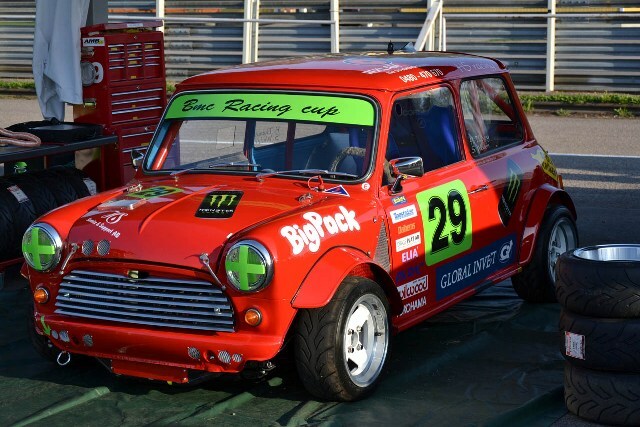 This race series started in 1991 to preserve the race history of the mini and at the same time make it an inexpensive method to go racing. Every year the BMC Motorsport Club arranges track racing license courses.It´s about 30-35 cars starting in every race, so it´s really door to door racing. 4hour long endurance race on FIA approved tarmac racetrack. 6 different classes , standard mini1000cc, Standard mini1275cc, sport mini, Modified mini (vtecmini) , Standard car with a fuel restriction of max 80Liters, Standard car with a fuel restriction of max 100Liters true out the hole 4 Hour race. Winner in each class is the car with most completed laps. Max 1.5hour nonstop driving is allowed, followed by 1h break then max 1.5h nonstop driving. So you have to do quick pit stop change driver and refuel(30Liter), HS-Racing does this in about 1 minute and 20 seconds, others do it in over 5 min. In a race we drive aprox 400km in full race pace, one lap is aprox 2.2km long. 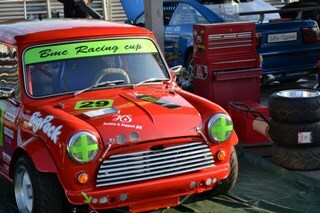 ”Sport mini” run with diff and 13” Yokohama A048 and free fuel and suspension, free engine tuning is allowed. 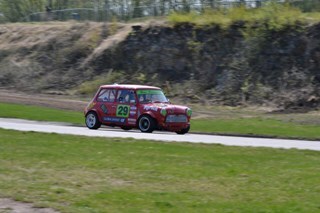 “Modified Mini” runs with maximum 1,6 liters engine and free fuel, free suspension, free tires and free engine tuning is allowed. ”Standard car” such as BMW or VW run in two different classes, one with maximum 80Liters throughout the hole race and the faster one uses 100Liters, free engine tuning is allowed. I hope this gives you a little info about the HS-Racing and the race series, and I hope you enjoyed reading it! Mycket bra skrivet på Mini Mania.